Flush out your cooling system with any garden hose. 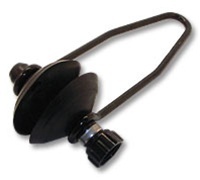 This round Motor Flusher works on most outboards and I/Os. Also provides a great way to test run your boat out of the water before hitting the boat ramp. Fits most Johnson/Evinrude®, Mercury®, Yamaha®, Chrysler®, Force®, Honda®, Nissan®, Suzuki®, and Tohatsu®.